The Theatre Royal Margate reopened it's doors after the closedown when it was purchased by Thanet Council on 29th September 2007, coincidently on the same night as our new operation, the Sarah Thorne Theatre Club began at the Memorial Theatre, Hilderstone, Broadstairs, run by some of the Royal's old staff. I can honestly say it was not planned, the STTC announced their opening date way back in June, well before the Theatre Royal's new management was in place. To celebrate the fact that both these ventures have Sarah Thorne in common, as either manager, mentor or inspiration, I thought it would be good to add a short biography on the history of this great lady by C. M. P. Taylor. Sarah Thorne, actress and theatre manager, was born in London on 10 May 1836, the eldest of the ten children of Richard Samuel Thorne (d. 1875), an actor and theatre manager, and his wife, Sarah, née Rogers (c.1813–1896). A member of a family connected extensively for several generations with the stage, Sarah Thorne was to become a talented and versatile actress and an able theatre manager. Her stage début was on 26 December 1848 in a pantomime put on by her father at the Pavilion Theatre, Whitechapel. After further appearances there, as Little Pickles in The Spoiled Child and in E. G. Burton's blank-verse play The Warrior Boy, for which she practised broad-sword combat, she played in minor roles at the Surrey Theatre in the spring of 1854 under Richard Shepherd and William Creswick. In the next years she performed in stock companies at Ryde, Sunderland, Newcastle upon Tyne, Sheffield, Hanley, and the Britannia Theatre, Hoxton. She also joined her father for the summer seasons at Margate (which he had taken in 1855); playing opposite some of the leading actors of the day, she contributed to the growing status of that theatre. She first appeared there on 6 August 1855, shortly after Thorne's opening on 28 July. In time, most of her seven brothers and three sisters also performed at Margate. For three seasons in the late 1850s Sarah Thorne was the leading lady at the Theatre Royal, Dublin, where, inter alia, she played Desdemona to Charles Kean's Othello and Lady Macbeth opposite Gustavus Vaughan Brooke. There followed starring tours in Ireland and Scotland. Some time between 1856 and 1859 she was married in Ireland to Thomas Macknight (1829–1899), already the author of an anonymous book attacking Disraeli, who later became editor of the Northern Whig. The couple had two children, Edmund (b. 1860) and Elizabeth (b. 1862), who married the actor–manager Henry Dundas (Arthur Harrison) in 1883. However, Sarah Thorne's commitment to the stage and Macknight's interests in politics and philosophy proved incompatible, and after only a short period they lived separately. In August 1863 she starred at Brighton and in 1865 she appeared, again in leading roles, including that of the eponymous Leah, at Paisley Theatre Royal, the Prince of Wales's Opera House, Edinburgh, and the New Theatre Royal, Jersey. Between October 1865 and March 1866 she played at the National Standard Theatre, Shoreditch, taking principal parts in a lengthy season of Shakespeare's plays. Sarah Thorne's first experience of management came in 1867, when she succeeded her father as lessee of the Theatre Royal, Margate; she opened on 29 July with H. T. Craven's Meg's Diversions and The Child of the Regiment. Her declared policy was to offer the ‘newest pieces approved in the metropolis as occasion permits’ but never to neglect ‘old and legitimate productions’ (Era, 4 Aug 1867). 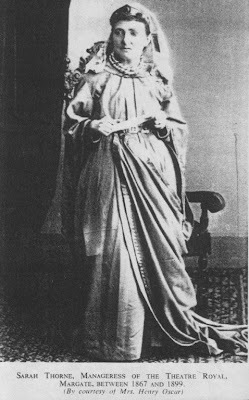 Her lease ended when the theatre was sold at auction in August 1873 to Robert Fort, and for the 1874 stock season she held a lesser management role. She returned briefly to Margate at Christmas 1874 during the tour of her now established annual pantomime. Thorne's second period of management was at the recently rebuilt Theatre Royal, Worcester, where she opened on 27 March 1876. There she engaged touring productions and provided, as at Margate, a stock company with a repertory of both classical and contemporary drama. Her association with Worcester came to an abrupt end when the theatre burnt down on 24 November 1877. She then formed a touring company to support the ageing Charles James Mathews. The withdrawal of Fort's latest tenant enabled Thorne to resume a lease at Margate in January 1879. Committed to the rapidly disappearing stock-company system, she maintained an annual summer season. For the remainder of the year she opened the theatre to some of the burgeoning touring companies, among them that of her brother Tom Thorne (1841–1918), who brought productions he had first put on at the Vaudeville Theatre, London (where he was manager from 1870). For a brief period in the autumn of 1879 she also leased Astley's Amphitheatre, London, where she appeared with her youngest brother, George Tyrrell Thorne (1856–1922), who had been apprenticed to her, in Boucicault's The Flying Scud. George was later a leading member of the D'Oyly Carte Opera Company. Sarah Thorne gained a substantial reputation for training young players. In 1885 she opened her School of Acting, advertising for ‘Ladies and Gentlemen’ wishing to enter the theatrical profession and charging £20 for three months' or £30 for six months' training. The regime, in which she was assisted on occasions by her sister Emily (Mrs Frank Parker Gillmore, d. 1907), included classes in ‘voice production, gesture and mime, dialects and accents, make-up, the portrayal of characters, the value of pace and the value of pauses’ (Morley, 110). Among her pupils were Harley Granville Barker, Helen Brinckman, Sarah Brooke, Louis Calvert, Gertrude Kingston, Beatrice Lamb, Evelyn Millard, her niece Nellie Thorne, Irene and Violet Vanbrugh, and Florence Ward. While it was customary for actor–managers to take apprentices, this school is regarded as the country's first formal drama school. In 1894 she leased the Chatham Lecture Hall, which she renamed the Opera House and used as a second venue for her stock company. Although she was acclaimed in a wide range of parts and genres, Sarah Thorne's preferences were for Shakespeare's Beatrice, Desdemona, Juliet, and Lady Macbeth, Kate Hardcastle in She Stoops to Conquer, Lady Teazle in The School for Scandal, and Leah. She insisted on good taste in her choice of plays and in their production, avowedly rejecting ‘anything vulgar in costume or language’ (Chatham, Rochester and Brompton Observer). She is said to have had a ‘somewhat imperious manner’ (Thanet Times, 3 March 1899), but a Margate contemporary spoke of her generosity, especially to the poor and elderly, whose rent she would sometimes pay herself (Chatham Observer). 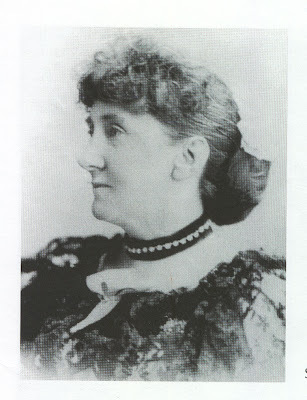 Sarah Thorne's last performance was in September 1898, at her benefit at Margate, when she took the part of Parthenia in Maria Lovell's Ingomar. Her last appearance on the Chatham stage had been in May 1896, as Lady Gay Spanker in London Assurance. She died at 3 New Road Avenue, Chatham, on 27 February 1899, just as what was to have been a celebration of her theatrical jubilee was being arranged by George Alexander and Gertrude Kingston for 16 March at St James's Theatre, London. She was buried at Brompton cemetery on 3 March 1899. After her death her son, who had been her business manager since the early 1880s, took over the leases of the Chatham and Margate theatres. Sarah Thorne (Née Rogers) was my Great Great Grandmother. 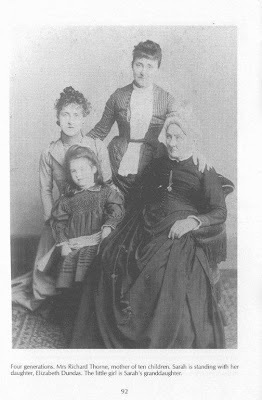 I would think the 4 generations' photo was taken around 1892 and the girl was Jessica Dundas (Bessie's elder daughter) because the younger daughter, Elizabeth, was born in 1890. Sarah died in 1896 and the girl appears to be about 8 years old. The Thorne theatrical tradition seems to have died out with the old generations.I did a bit of amateur dramatics in the 1960s but just for fun. You say that Sarah Thornes sister Emily married Frank Parker Gillmore. I believe that she married a John Parker Gillmore and their son was Frank Parker Gillmore founder of the American Actors equity. I am also a Great Great Grandson of Sarah Thorne (Nee Rogers), through George Tyrrel Thorne. The last actor in my line of the family was my grandfather, his acting career ended due to illness, the result of volunteering to fight in WW1 with the Canadian Army where he also performed in the 'Dumbells' Concert Party. We are delighted that our family acting history is remembered in Margate and through the Sarah Thorne Theatre Club. wife were my Great Great Grandparents. My Great Grandfather was George Sarah's brother, his son george Tyril was my grandfather. Thanks for showing this picture of the fammily. Does anyone have any information regarding Sarah Brooke, please? I'm interested in how she came to be a pupil of Sarah Thorne's and her initial time at the school. Are there records, for instance, that may shed light on her beginnings with Sarah Thorne? Sarah Brooke was her stage name; Florence Hannah her family name. Does anyone have any information regarding Sarah Brooke, one of the pupils of the school, please, specifically for the period during the time she joined and for a couple of years afterwards? Are records kept and if so are there any letters, photographs, playbills etc. relating to Sarah Brooke (nee Florence Hannah) during her time at the school? Many thanks if you can help.